This evening’s post is about a tool that I use quite a bit in both my jobs, the day job and the writing job, and I’ve heard through the Twitter grapevine that there are a number of writers who haven’t heard of this tool, or don’t know how to use it. 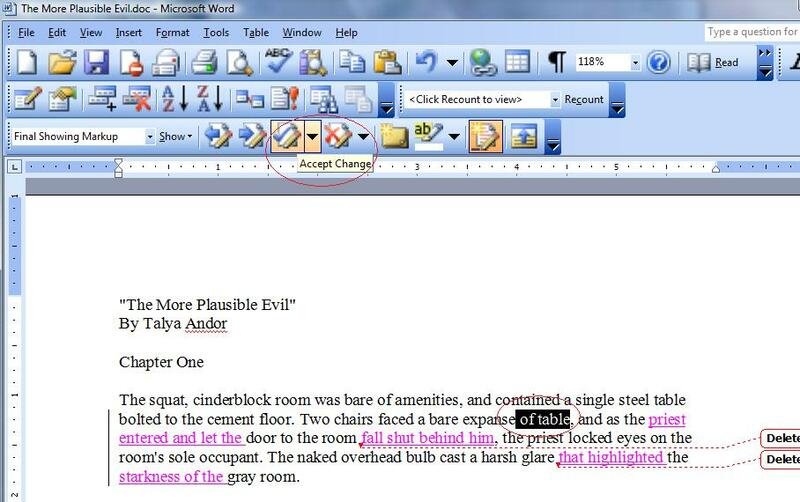 I’m taking it upon myself to provide a layman’s guide to MS Word’s Track Changes feature. 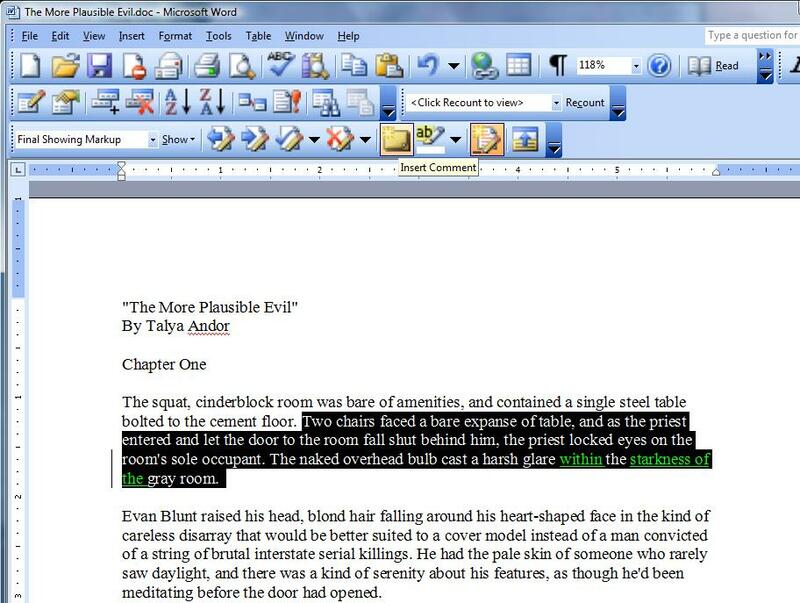 Once you start using it, it’s hard to imagine editing, or incorporating edits, without it! Click any image to make it larger. Sorry the embedded images are so small. Best to start simply. 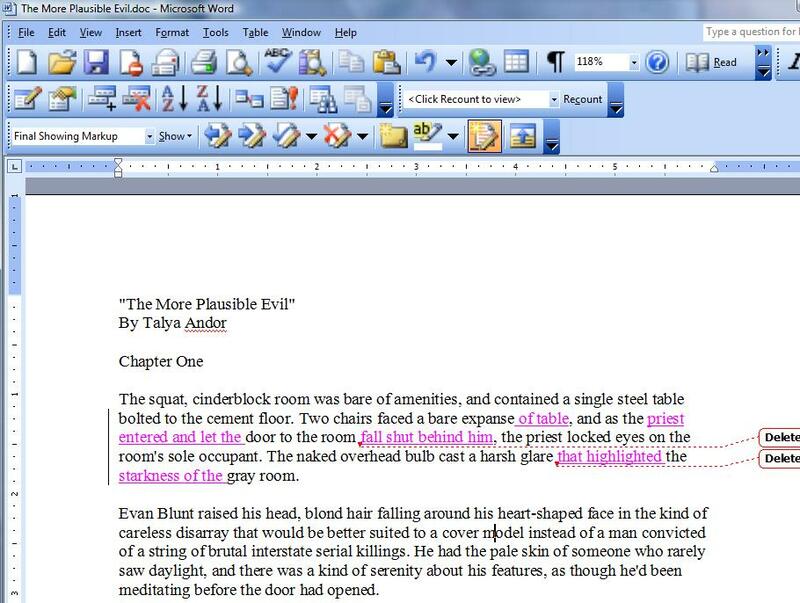 I’ll run through all three steps in Word 2010 as well as the older version. Below, you can see Word 2010. In the upper menu, locate the Review tab and click on it. The “Track Changes” button is right in the middle of the review toolbar. When you hover over it, it lets you know the keyboard shortcut as well as what it does. Click Track Changes once, and you turn it on. After you’re done incorporating changes and using the feature, click it again to turn it off. Once you’ve turned on Track Changes, anything that is added or deleted will be tracked in a different color. (Usually red, if you’re the first person making changes.) Deletions will be strikethroughs. There’s also a handy line on the left-hand side to let you skim through and notice paragraphs that may contain tiny changes, such as comma deletions/additions. Over on the upper right part of the toolbar, you have the review buttons. When you click “next,” it highlights the next change that your editor made. And here you can see I’ve gone through several edits and accepted each one of them, bringing me to the comment. 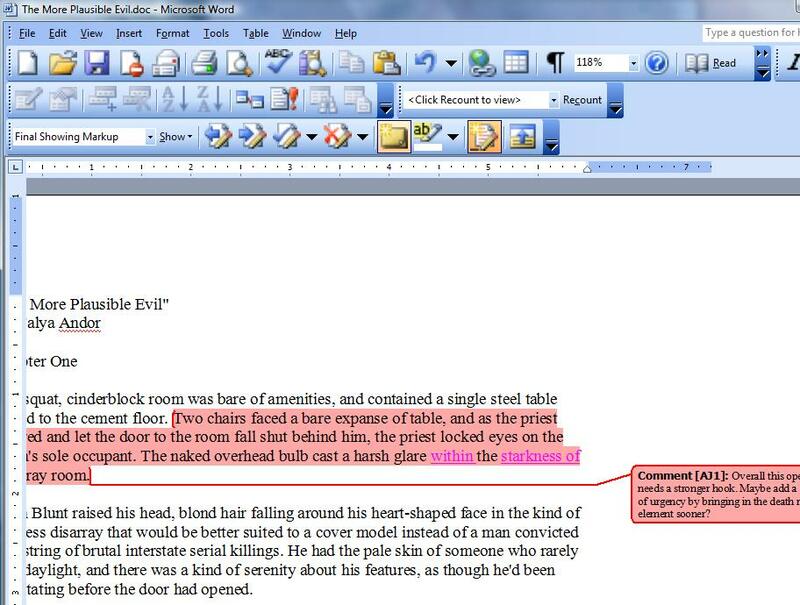 There are a couple of things to do with your editor’s comments. My personal preference is to leave the comment there if there’s something I’m adding to resolve the comment. 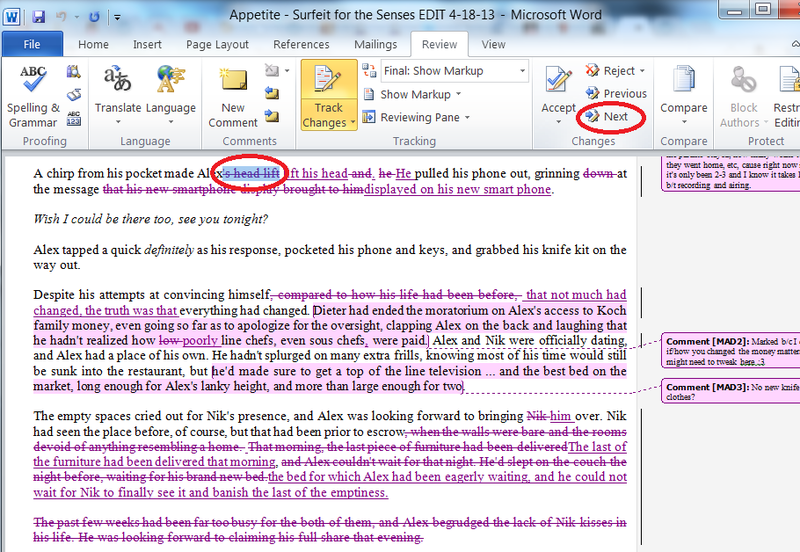 Track changes is still on, so my editor will see what I’m adding in response to her comment. In this case, it’s a comment I’ve resolved in the previous volume, so I don’t need it. Click the “Reject” button highlighted in the circle. 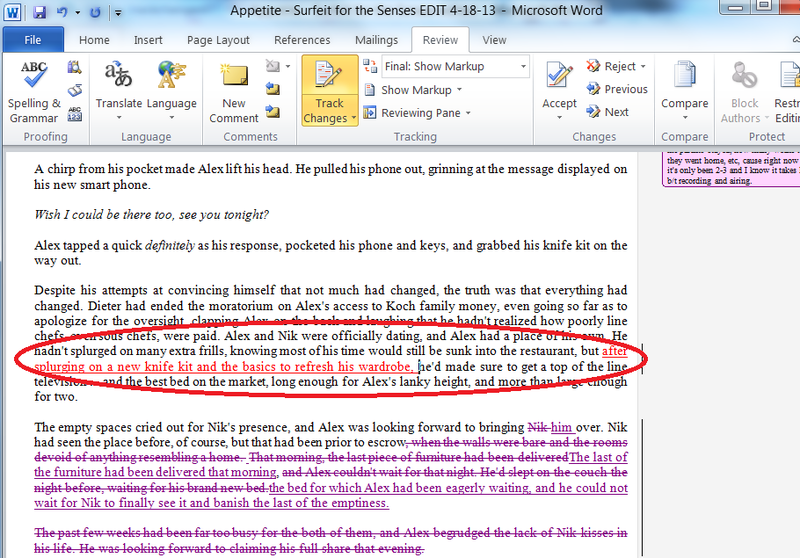 …and I added a little to the sentence, incorporating my editor’s suggestion. The third feature I’ll show is how to add your own comment. This feature is especially useful if you need to reply to a comment that your editor made. Rather than replying in the editor’s comment (which they wouldn’t necessarily notice), it’s better to add your own, so they can use their own review pane to go through your comments in turn. To add a comment, select a chunk of text. 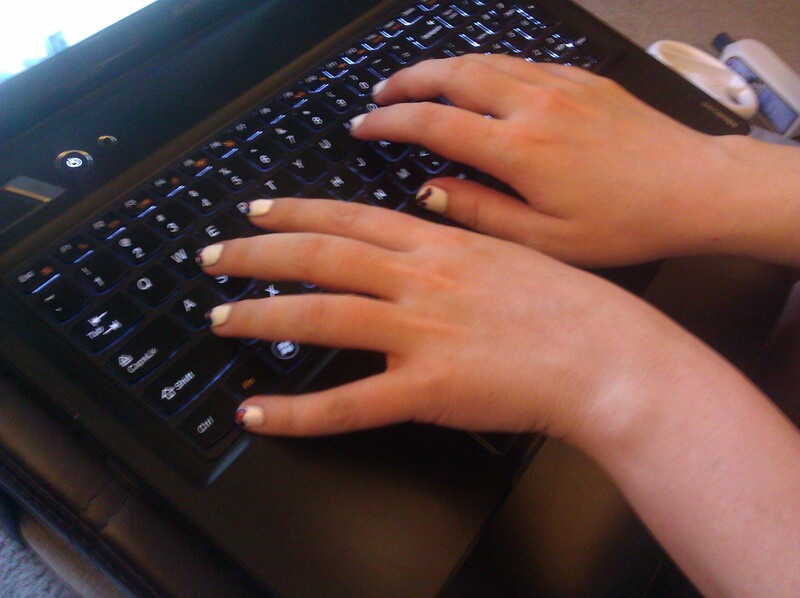 Usually you’ll be selecting a specific sentence, paragraph, or passage to which your comment applies. Notice the “new comment” button above. After you’ve highlighted your text, click new comment, and type away! 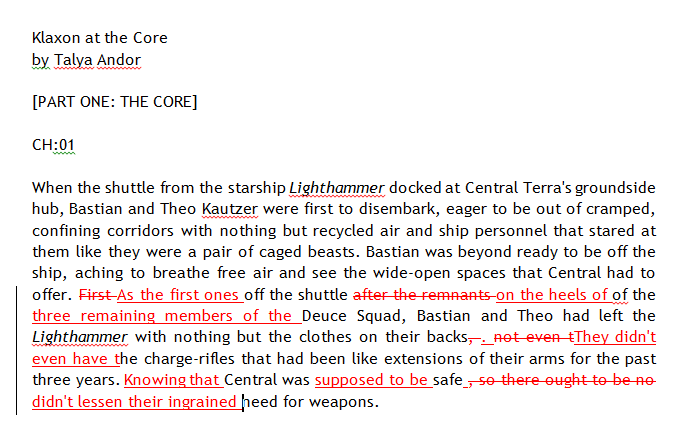 Here I’m adding a comment to my own document so that, when I go through and self-edit, I remember to consider adding more detail. And that’s using Track Changes for MS Word 2010! 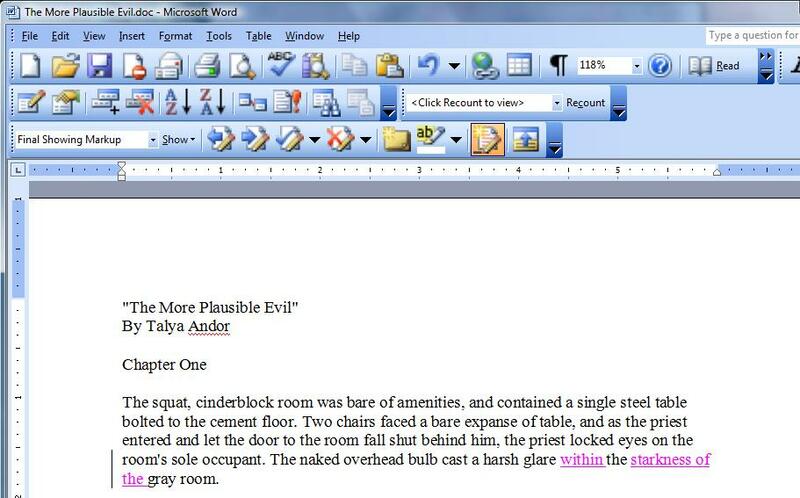 Here’s a quick rundown of the same features for the older version of Word. You may need to add the Review buttons from the Tools menu, I’m sorry I skipped that step. 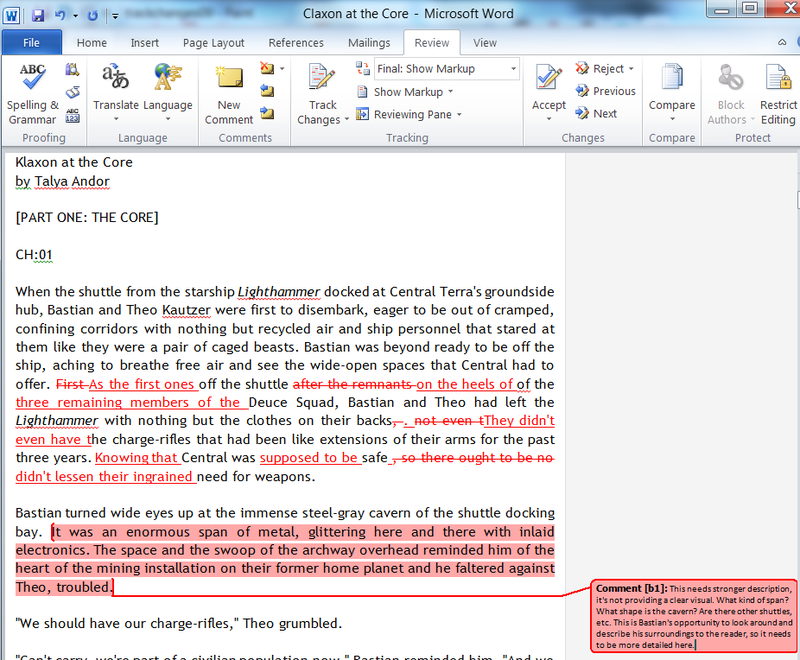 Basically I always have the Review toolbar open on my old Word program. 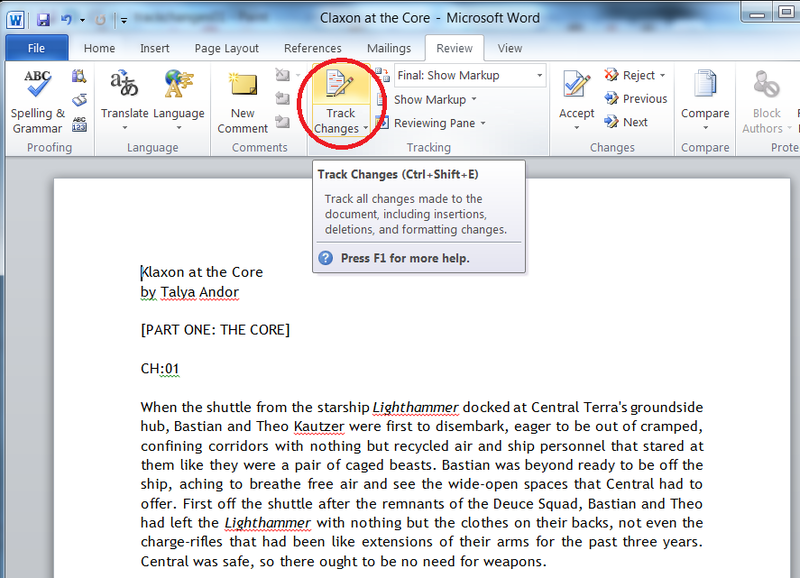 Here, I’ve circled the Track Changes button to show you where to locate it on the toolbar and turn it on. And a quick example of some changes I made, with Track Changes enabled. There are no separate buttons for comments and changes here. 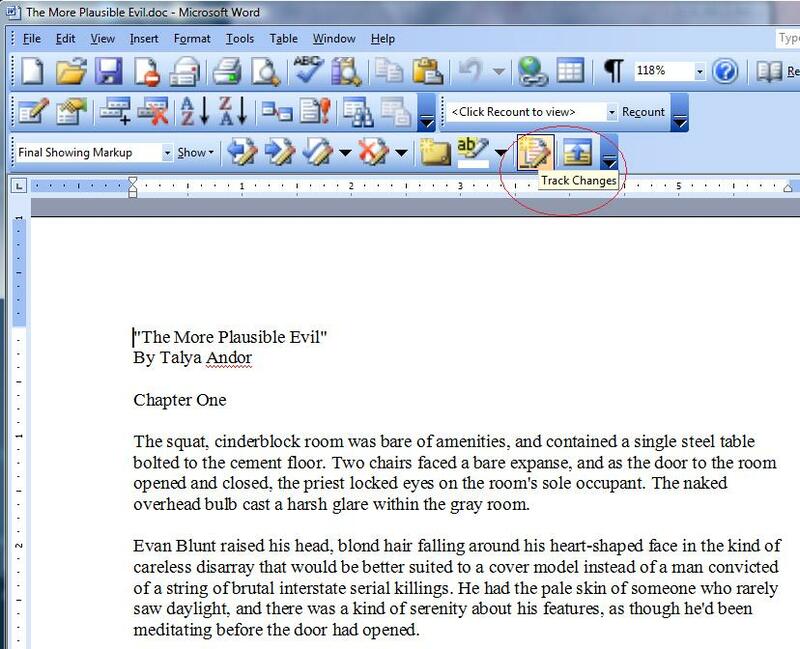 The arrow keys will take you to and from every change and comment in the document. 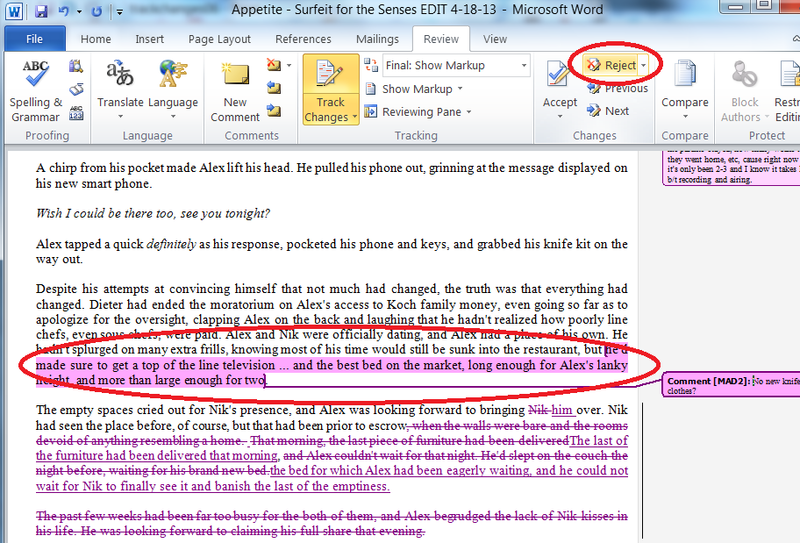 Here, the first change I made is highlighted. Click the “Accept” button to accept the change. 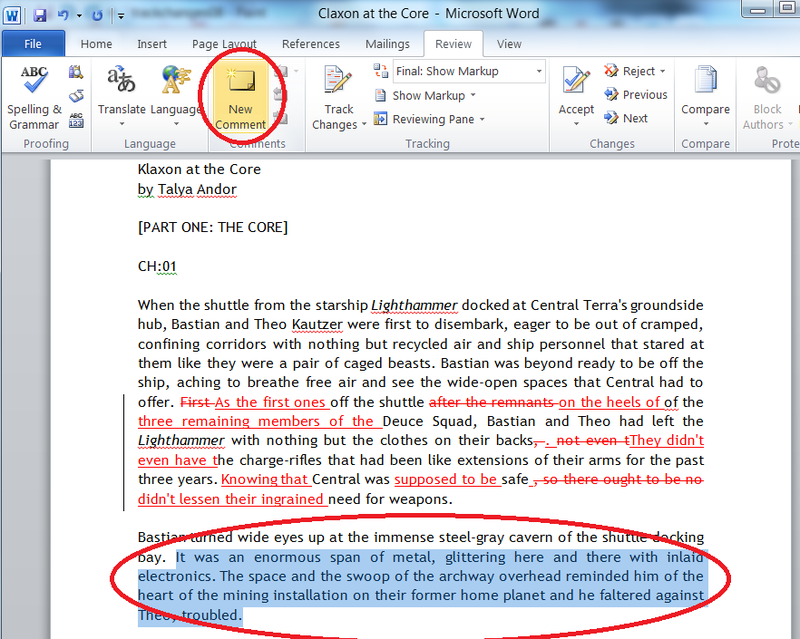 If you click the downward arrow beside it, you get the option to accept all changes in the document. I only recommend that option if you’ve read and agreed with all changes. My preferred method is going over each change individually, but your mileage may vary. Here, the previous change has been accepted. Unlike Word 2010, you have to click the “Next” button to get to the next change or comment. After accepting a few changes, I came along a change that I’m not going to incorporate exactly. So, here, we’ll click the “Reject” button. I made a different word choice, and Track Changes is still on, so the editor will be able to see that change. Pretty much the same! Select your text. Add your comment. And there you have it! Have a great rest of the weekend, everyone – go out and enjoy the super moon! Upcoming content … when I find the time! I meant to roll out a book review feature every other week or so, but the sad fact of the matter is that I don’t get to read as many books as I’d like to. I have a veritable stack, physical and virtual – Brandon Sanderson’s Warbreaker, the new Melanie Rawn fantasy, and a pile of ebooks, including the copy of Queer Fear that I won during the Hop Against Homophobia. Last month I finished a couple of books. I could review Bound, but it’s hardly a new release. Quite a popular book, though! Consider the prospect of book reviews a work in progress. I managed a mega-review a couple of weeks ago; I may be able to roll out one a month and have to consider that good. I’m registered as an author for Rainbow Con 2014, so more on that later. What it means for the immediate future is I won’t be able to take my typical two-month writing vacation in November. I’ve got to reserve a week for February, because my parents rented a guest house in Florida and want me to join them, and I need another week for April to attend the conference. It’s going to be way too much fun, I can tell already, though I feel somewhat presumptuous attending as a full-fledged author. 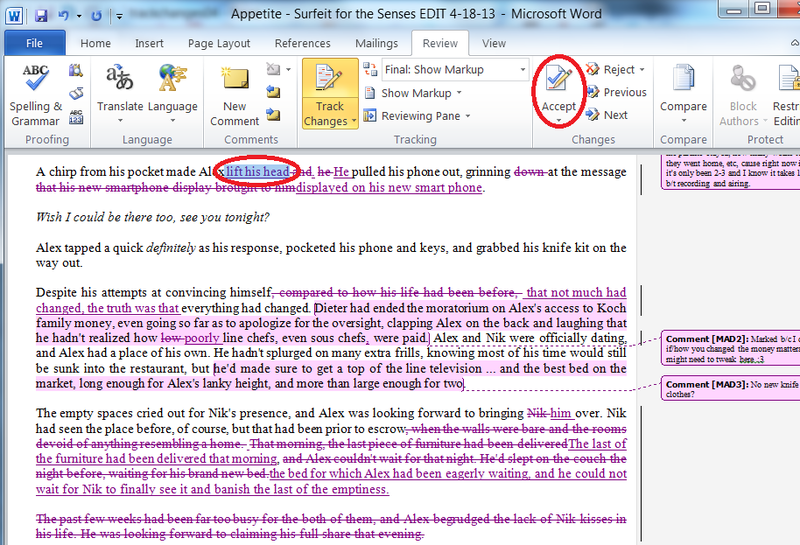 It still surprises me that a lot of writers don’t know how to use this feature. 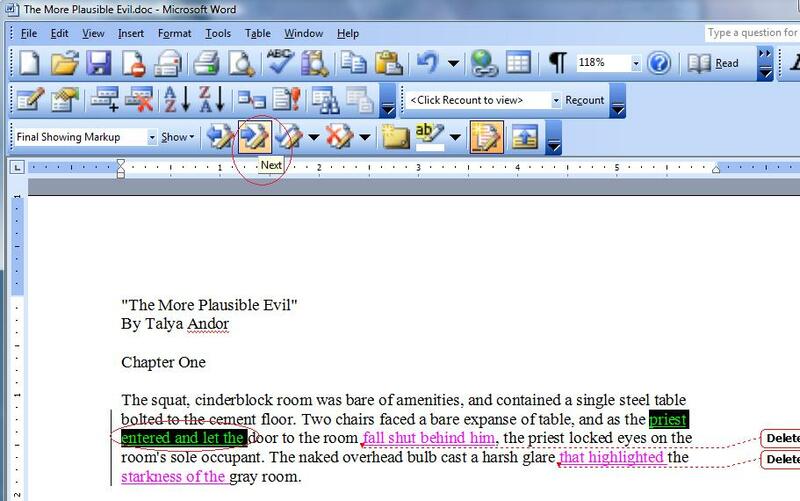 It’s a basic staple of editorial work, so when the author doesn’t know how to use that feature to incorporate edits, it can make everyone’s job harder. 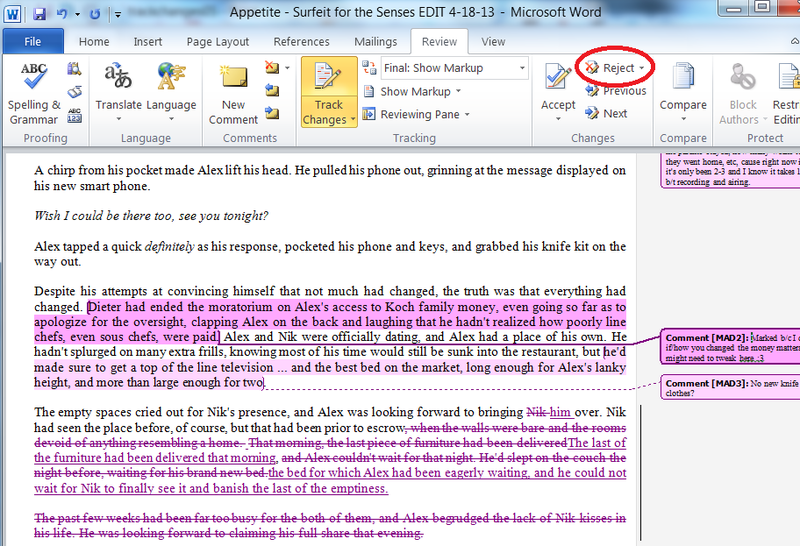 My plan is to give a quick rundown on how to turn it on and how to use it to accept/reject edits and add comments. The three basics! I really hope it’ll be something people may find useful. I planned on getting that posted this past Saturday, but the weekend provided some unexpected challenges. I can’t remember the last time I talked about my current projects in any depth, but this summer is shaping up to be super busy. 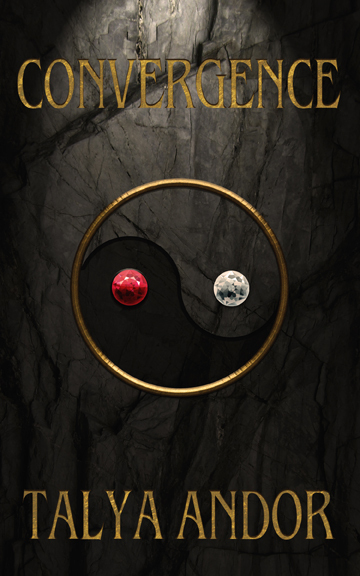 Klaxon at the Core is the sequel to Signal to Noise, and I’m currently writing that one. It’s progressing really well, and I hope to be finished by the end of the month. The original beta editor for Signal to Noise volunteered to beta Klaxon before I submit it for publication, which is fantastic because not only is he a superfan, but yay continuity! The More Plausible Evil is back to the outline-wrangling stage. An editor friend that I’ve had a writer/editor relationship with has reconnected with me, and we’re going to be working together to usher this from first rough draft to a much better, fully developed second draft! Right now the outline is giving me trouble (and there are only so many hours in the day) and I intended to have to outline finished last weekend. This weekend or bust! The More Plausible Evil is due in November. Somewhere in there I expect I’ll be incorporating edits and doing any necessary re-writes for Convergence and The Fall Guide. And after that! You’d think I’d take a break, but I’ll be writing My Sexual Superhero, a story about a geek and the charismatic hook-up who saves him from his sexual doldrums. It’s for a submission call for December, and it’s early enough in the planning stages that making my poor geeky protagonist work two retail jobs will fit in just fine. That’s it for updates – more to come! And if you’ve got content for the author blog to suggest, I’d love to hear it. 🙂 Have a great rest of the week, everyone! Sorry for the absence! I’ve had a lot to do, gearing up for my foodie trip to Chicago later this week. I’ve also been working to meet daily word count goals for Klaxon at the Core, and now I have the galley for The Competitive Edge to proof before I leave Thursday morning. Convergence will be a part of the “Proud to Be a Vampire” collection coming out this October. Really looking forward to it! And that gives me two autumn releases this year. Because technically, The Fall Guide comes out in autumn (Dec 3) after all. The graphic artist is awesome and the cover is absolutely everything I wanted it to be. Looking forward to this, so much! I haven’t been writing so much this month; I finished three stories last month, finished a chapter of something else this month, and I suppose I’ve been taking a bit of a break. 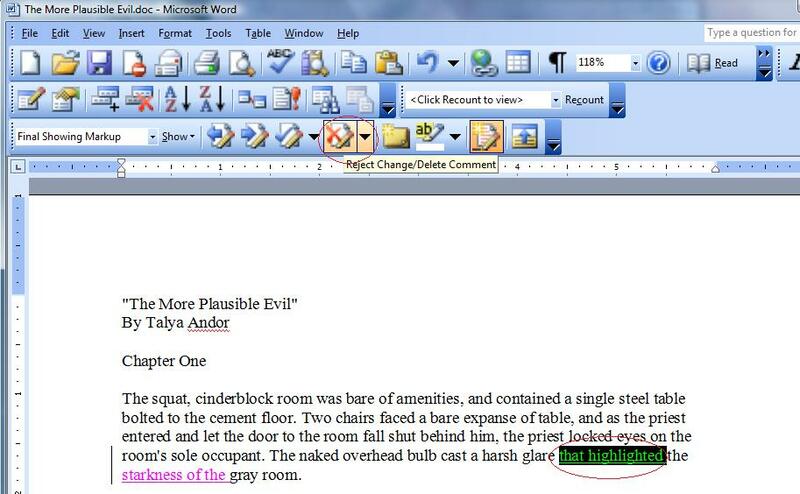 Substantial edits have come back for The More Plausible Evil. 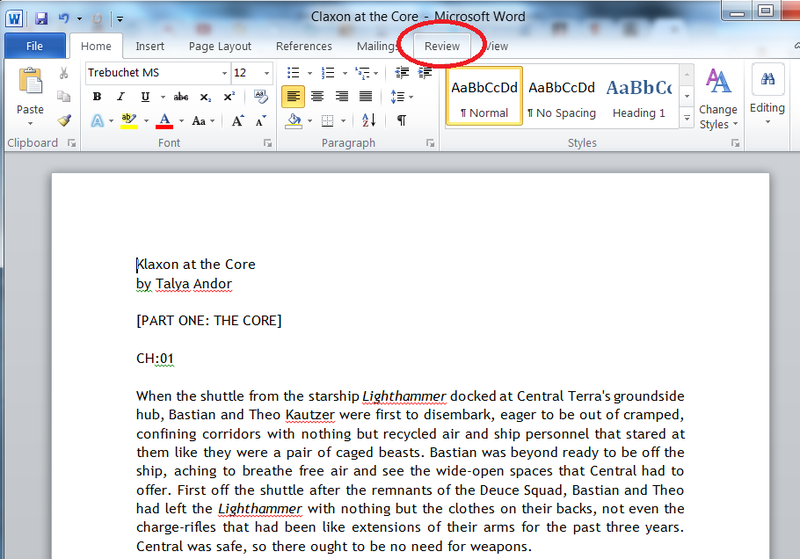 The in-document edits aren’t so bad, I think I could blaze through them in a day or two. But the overall story has two major issues, one that I could probably resolve, the other that I can’t because my beta thinks the story is too short for everything that’s happening. She thinks it would work better around my usual length, which is ~80-100k. Tough one. So, I’ll incorporate the edits to bring it to a good second draft, submit it, and present it to the press to get their take. The Fall Guide has a publication date of December 4th, 2013, and I have to think what to put on the cover. This is one of those where I’m contemplating saying “…dealer’s choice?” All I can think of is palm trees. That…yeah, probably better not. What else? Oh yes, this month I need to finish plotting the sequel for Signal to Noise, because I’m going to start writing it this month and it’s next month’s focus point.